Our guide is intended to educate you on the basics of buying children's ride on pedal tractors exclusively, so nothing about scoot along or battery powered here. Instead we hope to cover the fundamentals of all pedal tractors, so you come away more informed and know all the in's and out's than you would of previously. But let's not waste any more time and get right into it. The best manufacturers in ride-on tractors in the UK include Rolly Toys, Falk and Smoby, so its best your stick with either one of them. Less reputable brands may offer a far less superior product and intern may lead to problems down the line when after-sales or parts are hard to find or not available at all. These brands have been in the business of making pedal tractors for a long time and know what it takes to get it right. You can also look out for TOMY/Ertl or HTi ride on tractors, well they don't specialise in ride on toys, they do know a thing or two being in the game for decades. Every once in a while something breaks or goes missing. And well the reputable brands we've mentioned previous - Falk, Rolly Toys and Smoby - are usually good shipping out requested missing parts and accessories. The problem here is their parts could be pricey, so check the shop - online of in-store - before buying to see if they sell parts at good prices. With that in mind, be sure to look around for replacement parts in wheels and pedals, as they are the most likely to break first, as they take the most punishment. You can view available parts by contacting the maker directly (see manufacturers links above) or search online. Now, be aware we're not talking about age here, that's something different all together. What we're talking about here is the size you intend the tractor to be, and whether it will be suitable for the child's height. Children grow differently and are short now and shoot up later, and a big tractor for a small child will make the pedals hard to reach. Likewise, if the child is to tall then there knees will bump into the steering wheel. When visiting a pedal tractor product page, pay close attention to the measurements, this will tell you something about the overall dimensions and whether its to small or big. You will have to make the judgment on the child yourself. But try not to worry about this, generally pedal tractors are universal and will fit kids of all heights. With all that in mind, just a small thing but nothing to worry about. Look out for maximum weight, as you don't want to be caught out on weight restriction. There are many ride-one tractors for sale today, each one made to fit different size children, but age is a different thing. Let's take toddlers for example, they are to small and to short to pedal, and have not reached developmental stage for pedal toys at the moment. So they use scoot and push along toys, as oppose to pedaling ones. 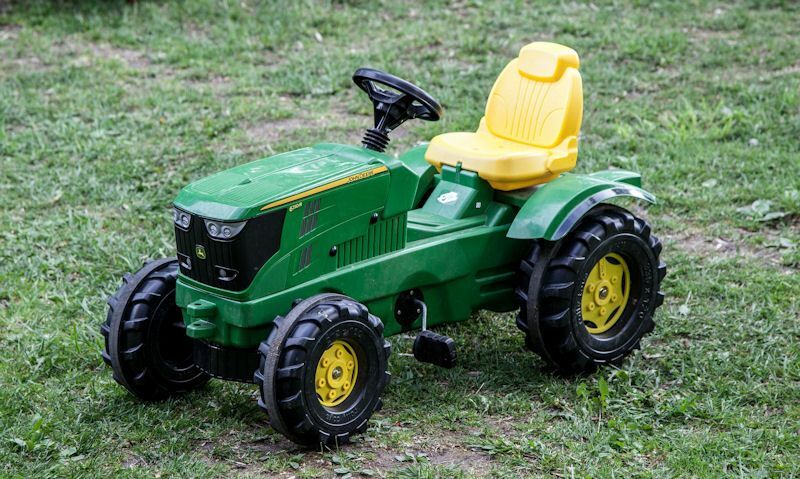 Then age 3 to 5 years its all about pedal tractors, before they loose interest and may want something more powerful, such as a battery powered tractor. So here you should be looking for a pedal tractor for a child age 3 years and up, with any age over just fine - there really is no cut off - its just a matter of when they loose interest like most toys. Its vital you check the manufacturer's recommended age beforehand. This day and age the big, bulky ride-on tractors doesn't mean heavy and hard to ride, they are constructed with light weight materials that make a lighter tractor overall. Smaller, ride-on tractors aimed at toddlers usually come under 3kg, but you can expect tractors for kid's age 5-6 range, weighing 8kg all the way up to 13kg. This is also true for tractors for kids age around 3 years, but will be in the lighter category. If you do go for the heavier model (usually chain driven), you should expect the child to have plenty of strength, but it really doesn't matter if this isn't true right away. Gradually, they can grow into it well at the same time build up strength and be pedaling away on the tractor before you know it. Here's a tip; head off to the shop with the same model in stock to check for yourself, then ask for a cheeky test drive before committing. Pedal powered ride on tractors can mean one of two things. First pedal powered is just that, the wheels are spun as the child forces the pedals around, this in turn depends how fast or slow they move. Then with chain driven tractors, they work like a bicycle with the child allow to pedal and remove there feet for the tractor to repel on its own. Rather confusingly, chain driver can mean letting go of the pedal to go forward without pedaling, or in some models the pedals always have to turn, with feet on or off. Chain driven pedal tractors are only found really in the larger tractors, which has the mechanism hidden away inside the body. Regardless of which one, pedals on ride on tractors are usually developed universally, with the same full turn producing the same length of travel. Probably the most popular pedal tractors are often the most simplest. And the less hassle are ride on tractors bought as a stand alone, with no trailers or loaders. That being said, well not true for front loaders, most pedal tractors do come with a standard rear hitch, so an upgrade can happen later with a nice matching trailer from the same manufacturer as the tractor they own. There are plenty of ride-on tractors for sale in the UK, and among them are tractors sold on there own which are the easiest models to buy. What we would recommend is going for a stand along tractor, with the option to add a trailer later, as there is extra cost with accessories. You can buy a ride-on tractor and trailer these days without taking an extra hit on your budget. Stand alone tractors are a nice choice, but you don't have to buy a trailer on its own. In fact there are plenty of ride on pedal tractors with trailers, so all that you need is included. But well we recommend buying a tractor first, trailer later; at least this way you don't have to worry about compatibility issues - if it comes with the tractor, then its fits. The trailers that do come with pedal tractors are basic for smaller, lightweight models, with the chain driven, powerful pedal tractors demanding larger, compatible trailers. And in our opinion, the most impressive trailers. Don't assume the ride-on tractor comes as is, if you shop around you'll find tractors with trailers, front loaders, lights and sounds and even wheels and seat adjustments. So if you want to add real play value to the young tractor driver's role playing, why not go with an attachment like a front loader for picking up dirt and sand for dumping. When buying a pedal tractor with a front loader, make sure it comes with the said loader. If you intend to buy a front loader later (which by the way is hard to buy separately) you will be greatly disappointed. So if you need a tractor with front loader, buy the two together. But like most ride on tractors, out of the box the loader with parts of the tractor require self-assembly. Which is a blessing really, if anything breaks, you'll know how to dismantle and put it back together again. Taking all these small parts, metal fixing and balancing into consideration, supervision will probably be needed. Riding a pedal tractor is similar to learning to ride your first bike, it starts with balance and tipping over can happen. So walking with them on a nice smooth tarmac path should help them along, then again if you take them on uneven ground this will cause issues. Absolutely do not allow them to pedal on grass either, they will find it incredibly hard. When learning to ride there first pedal tractor, they may become unbalanced and tip over to the side, hit a pot hole, or run into something. They could also lean to far back, so only when you know they are qualified to be left alone, keep an eye on them in the meantime. Before you go out and invest in a ride-on pedal tractor for the young driver, don't be disappointing to discover there's no storage space, so plan ahead. With that in mind, you can store it away in the hallway, under the stairs or the most common storage space, the garden shed. But if you plan on leaving it out in the elements in the garden, consider what damage the weather could do to it over time - because the weather can damage it in many ways. That includes damp getting to the steel bars and fasteners which will rust and even make it hard to pedal, or not at all. Pedal powered tractors are the most reliable after sit and scoot, this is because little can go wrong with less moving parts. And those things that do go wrong can be fixed by yourself with widely available parts, made to be repaired by an adult. Scoot along are for toddlers well battery powered tractors can break - pedal tractors will build up strength and allow them plenty of exercise.